Nash Ford Publishing is proud to announce the publication of David Nash Ford's first printed work and you can order your own signed copy exclusively from our distributors, Reaveley Books. They are able to accept payment on the Web via your Credit Card or PayPal account, or by snail mail with a UK cheque. 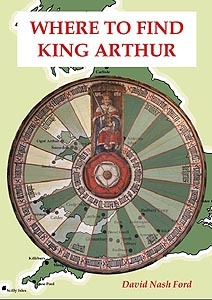 The origins of King Arthur have intrigued people for many centuries. As the owner of the Early British Kingdoms website, David is regularly asked to comment on the various historical sites associated with the legends. In this twenty-four page paperback A5 booklet, he has explored the claims of each major location through text and illustrations, in a form which is both accessible and informative. David Nash Ford has a talent for bringing historical subjects to life. He is the author of the Early British Kingdoms and Royal Berkshire History websites. Having gained an honours degree in History and Archaeology at the University of Reading, he has continued to research many related subjects, including King Arthur and local legends. This research has led to his being invited to contribute to many international publications and radio broadcasts. All illustrations from this work are available from our high resolution picture library for reproduction elsewhere. Please e-mail us for details.